Independence Day Speech - be prepared! You may be called upon to say a few words at your Independence Day Celebration! Independence Day - today of all days, you need to find the right words to "say it right" as we celebrate our independence from Britain and the birth of our democracy. A celebratory speech to honor our forefathers - succinct, yet meaningful. Happy celebrations to one and all! Today, the Fourth of July, we commemorate and celebrate our independence from Britain. It is a time to pay our respects to our pioneering forefathers for their strength of spirit, their unfailing courage and their indomitable commitment to their vision - a vision that culminated in "the land of the free and the home of the brave" being born. 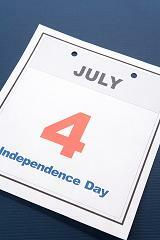 Independence Day is not only a day of reflection. It is also a day to pay tribute and to express our gratitude for our freedom still upheld today. It is a day to look forward to tomorrows that are bright with opportunities still to be explored and attained. As you celebrate Independence Day with your loved ones, your colleagues, your neighbors or even acquaintances - take the time to quietly acknowledge the vision of a dynamic nation united in freedom and independence. Whether you are celebrating: surrounded by the "red, white and blue", listening to the salute to the union, fired at noon today - one gun for each state in the United Nations, sharing family picnics, fireworks, parades or family gatherings - we wish you a magical Independence Day and a year ahead lit by hope, grace, freedom and integrity. Independence Day Speech - Fourth of July celebrations - words of wisdom and a free written speech as a salute to a special day.